A hardware device which allows users to control multiple computers from a single mouse, video monitor or keyboard is called a KVM switch. KVM is an abbreviation for Keyboard, Visual Display Unit, Mouse or Keyboard, Video, Mouse. Multiple Computers can be connected to KVM, but usually only few computers are controlled at any certain point of time. There are also few KVM switches which work in reverse and i.e. s single computer can be connected to multiple keyboards, monitors, and mice. This kind of configuration is useful when operator wants to access a single computer from two or more locations. 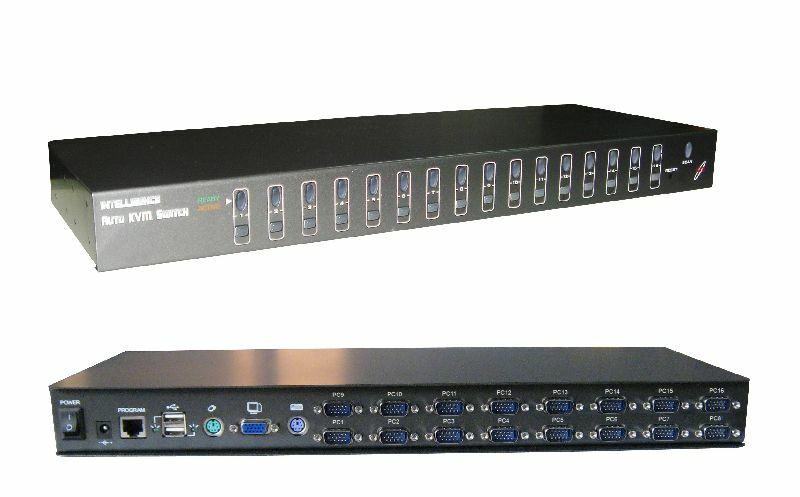 Latest KVM switches can be connected to USB devices, multiple computers and speakers. There are many kind of KVM switches available in market like USB KVM, PS/2 KVM and IP KVM, all offered in 16 Port KVM, 8 Port KVM and 4 Port KVM. You can also integrate KVM switch into LCD Drawers whilst occupying only IU of space. Both PS/2 and USB devices are supported by KVM on same switch. 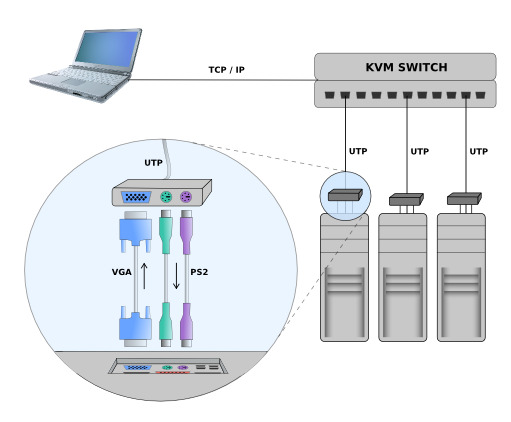 KVM switches can provide remote BIOS Level access to as much as 128 servers. KVM are quite popular and organizations from hospitals to banks use them, specially because their networks are widely spread out. One more feature or advantage with KVM is Climate monitoring, i.e. they provide resolutions to guard hardware at the Data Center. For hardware KVM switch there are many software available for use. Input Director, VNC (Virtual Network Computing), MaxiVista, PC Anywhere, Synergy and Synergy + are some of them. They do switching in software and forward input over standard network connections. 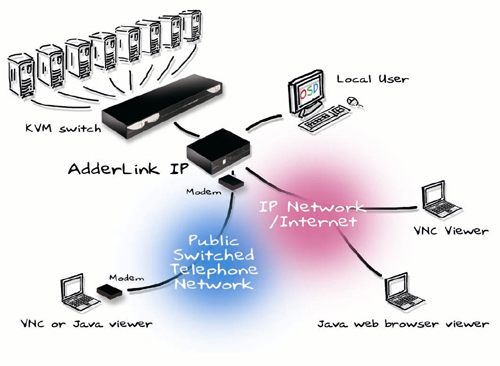 Advantage of these software alternatives of KVM switch is that they reduce number of wires required plus it makes users forget that they are using two computers because of the screen edge switching. Now looking for disadvantages first of all these software alternatives usually require additional software to be installed in each of the target computers so that clients can remotely attach to it. Software alternatives are impossible to use is the computer has stopped responding to system network connection or it is very busy also, if the Operating system is not installed on the host side these software can’t be accessed. Local Remote and KVM over IP are the two remote KVM devices available. Out of these two KVM over IP is more widely used. A KVM over IP uses a dedicated microcontroller and potentially specialized video capture hardware in order to capture mouse and keyboard signals, video, they are compressed and converted into packets and then sent over an Ethernet link to a remote console application which convert them back into dynamic graphical image. To make it available throughout the BIOS boot process KVM over IP switch is connected with a system’s standby power plane. KVM over IP allow multiple computers to be controlled remotely across a wide area of network, telephone line, local area network using TCP/IP protocols. KVM over IP devices have been applied in many different ways. PCI based KVM over IP is used for the graphic capture portion. It uses variation of a technique called screen scrapping where the PCI bus master KVM over IP card access data directly from the graphics memory buffer. However in these cased PCI card must know which graphics chip is working with and what graphics mode this chip is currently in. This is because contents of the buffer can be interpreted properly as picture data. This entry was posted in Colocation Services India, Data Centers India, Fully Managed Data Center and tagged Colocation Services India, Data Center India, Fully Managed Data Center. Bookmark the permalink.